This is an email I recieved this week from a student who wishes to remain anonymous. The message is great so I share it with you. I am grateful that BCHS is such a great place to work. Graduates … you amaze me! I am in awe of you. This is a message from a former Bishop Carroll High School student and it is addressed to each graduate in the class of 2015. Before anything else, congratulations! You have endured, grown, been challenged by, and are forever changed by your BCHS journey. 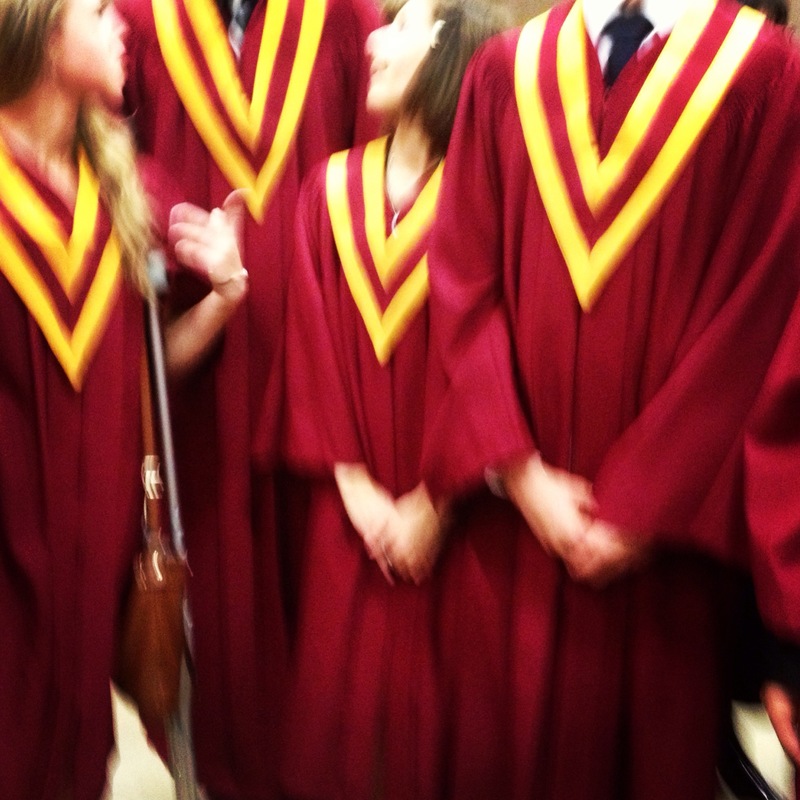 You have earned the green slips, made the cutoffs, and can now call yourself a graduate of Bishop Carroll High School; a great Calgary institution that has developed a legacy for turning out exceptional people – people who forge incredible impacts in the world and help make it a better place. My purpose for writing this is to imbue you with a few friendly words of wisdom, some advice, and to call you to service in your community. What is said in this message is opinion not doctrine and it is meant simply to convey some words of encouragement as you close a proverbial chapter in your life and turn to the next. Bishop Carroll High School is not a school for a neighborhood or a quadrant – it is a school for the community of Calgary. As a result, it is a place of great diversity and great opportunity. The experiences you have had and the environment you have been in is something that is unique and one that has set you up differently than other people your age. You have been given the Carroll Advantage – the opportunity to learn in a system that hones your strengths, remedies weaknesses, and lets you discover who you are. The result: an ability to think critically, to manage yourself, to take ownership of your destiny, and the ability to make a profound impact on those around you. Self directed learning is a fantastic way to learn and appreciate personal responsibility, develop self management skills, and ultimately learn who you are and grow as a human being. The opportunities, skills, and experiences found in and taken from Bishop Carroll High School create potential for great things in every graduate. All of you have potential that knows only the boundaries you set for yourselves. There is no limit to what you can do; so believe in yourself, set your standards high, dream as big as you can, and never ever quit on something worthwhile. My time since graduating has afforded me the ability to experience many great things and meet many great people, but every time I encounter something new – a challenge or an opportunity, I often find myself reflecting back on the experiences I had as a student at Carroll. Truthfully, everything I do now is somehow connected back to my time at Carroll. No matter what I face I always tell myself I am a Carroll grad and that gives me the confidence to do just about anything because who I have become was largely started in my three years at Carroll. If nothing else, please take some time to reflect on your BCHS journey: the highs the lows and understand how those experiences will always stick with you. In the bright times use those memories to reflect fondly and appreciate yourself, who you have become, and who you will grow into. In the challenging times use those memories to remind yourself of all you have accomplished and tell yourself you can do anything you set my mind to – you will be better for it. No matter what you face, who you face it with, or what you end up doing know this – if you understand and appreciate what your time at Carroll did for you and that it has helped make you then you really will be able to do anything. There is nothing quite like the confidence or the last minute quick thinking of a BCHS graduate. Bishop Carroll High School is different than anywhere else, from what I have seen and experienced since graduation it truly does prepare you better and make you more ready for the world. The world you graduate into is one that seems to change exponentially each year. New challenges and new opportunities will demand more of everyone and will likely challenge us as a global community in a way we have not been challenged before. It will take people from diverse backgrounds and skill sets to confront them. Regardless of your path after high school YOU have the power to help change the world. Change does not have to come from grand actions or mega projects – the world can be changed at the grassroots level by the sum of individual actions. So find something you are passionate about – something you love, do it, do it well, and use it to help make the world around you better. Although not everything will be recognized no good action is too small. The opportunities and skills you have now give you the BCHS grad a responsibility to help make a positive impact on the world around you and doing what you love is a great way to make the world better. .